Most victims suffocated to death. Fire department said more lives could be saved if they had been summoned immediately. At Delhi’s Ram Manohar Lohia Hospital on Tuesday, Somshekhar, 57, calmly answered questions from the police after he identified the bodies of his mother, brother and sister. They, Somshekhar, and his two nephews had come to Delhi from Kerala on February 7 for a wedding the following day, and stayed at Hotel Arpit Palace in central Delhi’s Karol Bagh. A fire had broken out in the 46-room hotel. His mother Nalini Amma, 84, brother PC Vidyasagar, 60, and sister Jayashree, 53, were among the 17 guests and hotel staff who died in the fire. According to the police, most of them suffocated to death. Fire department officials said there were 53 people in the hotel out of which 35 were rescued. They said one person is still missing and three people were injured. 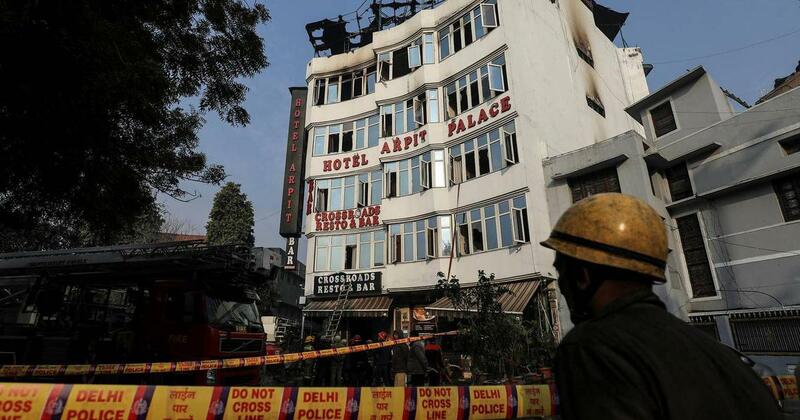 Firefighters at the site of the fire in a Karol Bagh hotel, in Delhi, on Tuesday. (Photo credit: AFP). Hotel Arpit Palace is situated in a narrow lane among several other hotels, residential buildings and even a school. Choudhary added that the fifth floor of the hotel, on which a restaurant stood, “seemed illegal”. The restaurant was badly damaged in the fire. According to the fire certificate issued to the hotel by the Delhi government in 2014, the fifth floor was “closed by bricks”. The police has filed a first information report in connection with the case while the Delhi government has also ordered a magisterial probe. Delhi Home Minister Satyendar Jain, who visited the site on Tuesday morning, said buildings in the area had more than four floors, which violated building norms. He ordered the Fire Services Department to carry out an inspection of the commercial buildings in the area. “We saw a canopy was put up on the terrace and tables and chairs were laid out. Inside in the rooms, wooden panels were there on the walls,” he told The Hindu. 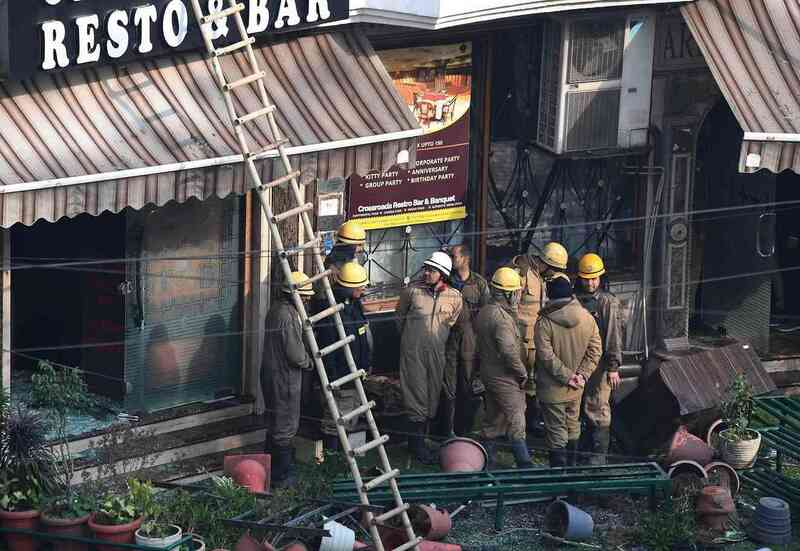 Firefighters at Hotel Arpit Palace on Tuesday. (Photo credit: AFP). Of the 17 victims of the fire, 12 have been identified, four are yet to be identified while one was “beyond recognition”, according to the police. 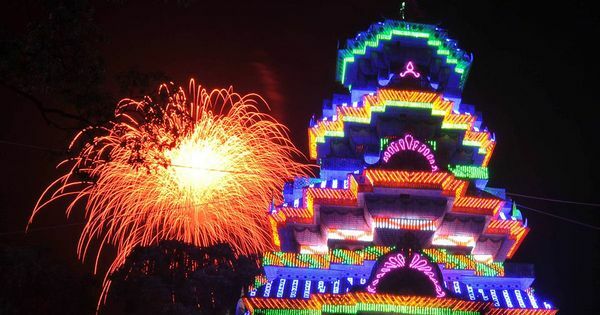 The victims who have been identified are PC Vidyasagar, 59; P Nalini Amma, 84; Nand Kumar, 34; Aravinth Sukumaran, 35; Pranav Kumar Bhaskar, 33; EVS Chalapattirao, 50; Jayashree PC, 53; Rabia Jusafbhai, 52; Tara Chand, 30; Lal Chand, 45; Suresh Kumar, 42; and two Myanmar nationals identified as Dawmla May, 67, and Tun Hla Sein, 32. 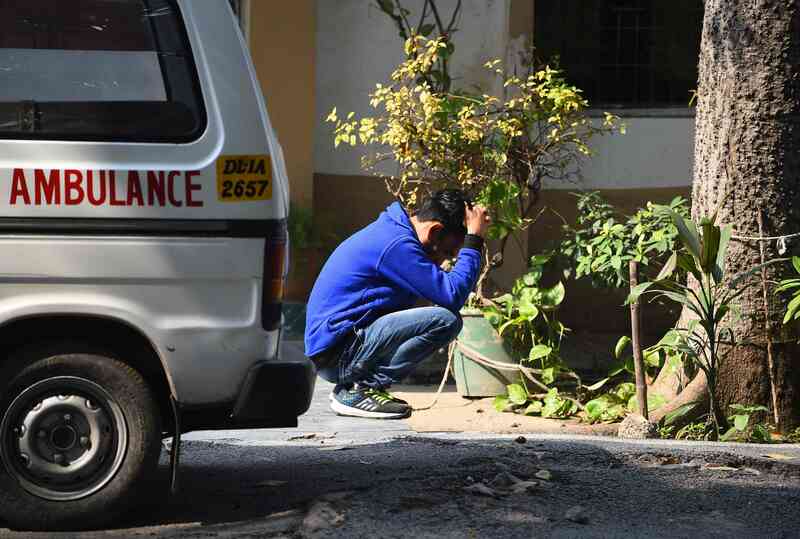 While 13 of the deceased were taken to Ram Manohar Lohia Hospital, two were brought to Lady Hardinge Medical College and two others were admitted to BL Kapur Super Speciality Hospital. At Ram Manohar Lohia hospital, families and guardians of the deceased crowded the information desk while the police were sorting through identity markers such as watches and gold chains. The police identified EVS Chalapatti Rao as another employee of Hindustan Petroleum Corporation Limited. He was visiting Delhi from Vishakhapatnam. Nand Kumar and Aravinth Sukumaran were visitors from Tamil Nadu. They work at a garment factory there, which is headquartered in Gurgaon. The brother of a hotel staff member who died in the fire outside a mortuary at Lady Hardinge Hospital in New Delhi on Tuesday. (Photo credit: AFP). On Tuesday, many local residents came to gawk at the hotel. Fragments of its shattered windowpanes were scattered below the building. A senior secondary school stands next to the hotel. 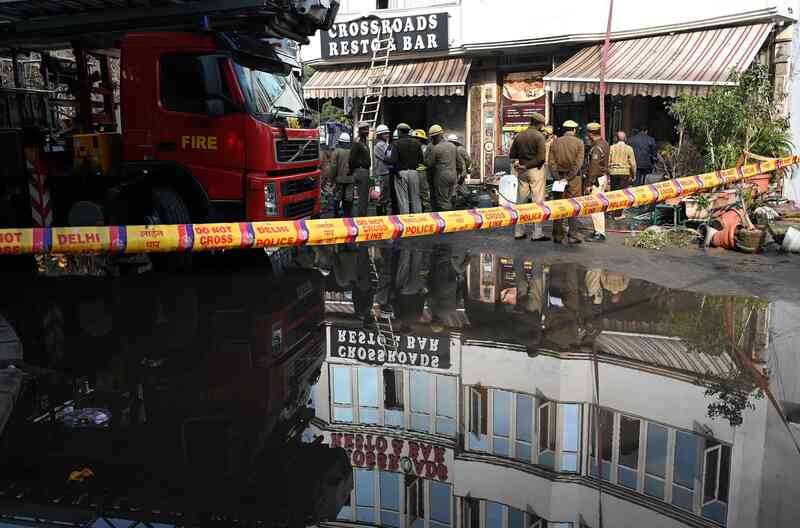 “It is a great cause of concern if a school is right next to the hotel which caught fire,” said Archana Konde who had come to drop off her daughter at school.